RRB ALP Exam Dates 2018: Hi Viewers good news for all candidates who are preparing for the Railway Recruitment Board Assistant Loco Pilot and Group D Examinations. 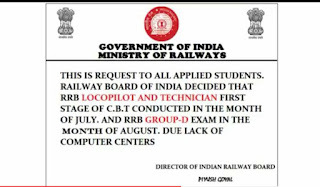 Recently Indian Railway Board has given the written test dates for the Assistant Loco Pilot and Group D Online Computer Based Test (CBT) 2018 Examinations. Due to huge number of applications are receiving by the RRB All Boards at now board has announced officially C.B.T Exam conducted in the month of July for all ALP Candidates and Group D Exam in the Month of August. Below check the all information. Railway Recruitment is the Largest Recruitment in India every year this board is filling so many number of vacancies in different type categories like as Assistant Loco Pilot, Group D, NTPC (Non-Technical Popular Category), Junior Engineer and Section Engineer Posts. This year 2017-2018 the RRB Board has recruit the New ALP and Group D Vacancies under the CEN 01/2018, CEN 02/2018. This Advertisement all over in India more than two crores applicants are applied for these posts. At present so many number of brokers and job racketeers are easily trapped unemployed candidates the recruitment process is purely based on merit list and computer based. RRB is never appointed any agents or coaching centers for action on its behalf. Everyone should believe only RRB Websites news or Employment Newspaper.